As a part of my blog's second anniversary again I am with a guest post by well known blogger Whose recipes are popular in the blogosphere.Yes....its Priya Suresh of Priyas Versatile Kitchen. Priya is one such wonderful friend and got her friendship through Blogging Marathon.I love her recipes especially her baking and the way she presents,Thank you so much Priya for this wonderful recipe. Am Priya suresh, who blogs at Priya's versatile recipes, am a bakeholic who loves to bake. My fellow blogger Nalini, no no she is more than that, a wonderful sister, a down to earth darling, a truthful friend and my close buddy asked me few months back,yep you are rite she asked me long back to write a guest post for her but i couldnt send her my guest post earlier. Finally i decided to make a guest post for a celebration. Nalini, the blogger celebrates her two years of blogging life in September and my best wishes to her to keep going in this incredible virtual world. Actually i know Nalini through blogging marathon before few years back,i'll never forget to visit her space and she share mouthwatering recipes with breath taking pictures. Beware dont go to her space while you are hungry,yes each and every pictures of her food will tempt you definitely and you will go crazy. If you are searching authentic dishes, just check her space and you will definitely fallen in love with her post. When she asked me for the guest post, she wants me to make a French bakes,but sorry Nalini i couldnt keep my words, i prepared a no bake French dessert specially for you.Hope you will definitely like this eggless, no gelatin dessert. Sending to you with loads of love my dear buddy. Soak the china grass in 3/4 cup of cold water for 1 hour. Put to cook on a slow flame until it dissolves. If you are using agar agar powder dont do this step with it. 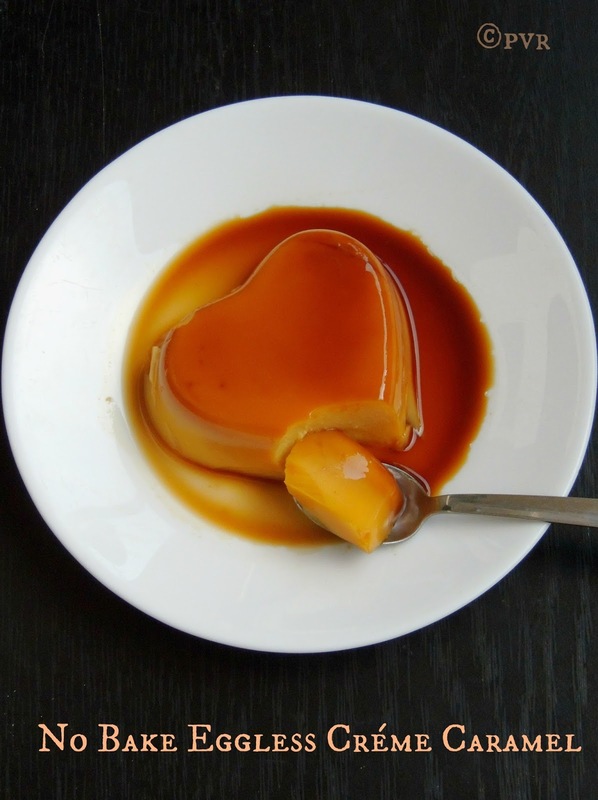 Meanwhile make a caramel syrup, cook the sugar of caramel with water,pour the water just to cover the sugar. 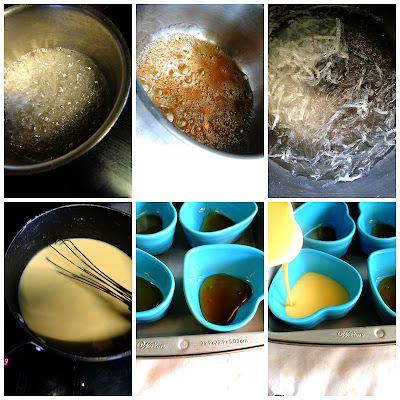 Cook the sugar until they turns golden brown, just tilt than pan and pour the caramel syrup to the ramekins and keep aside. Add in the custard powder,sugar to the milk and whisk well until the sugar and custard powder gets dissolves. Cook this mixture until its turns semi liquid. Now add the already prepared agar agar or agar agar powder. Cook everything in simmer until it turns thick. Let it cool a bit, spoon this eggless custard to the already prepared ramekins. Once the custard gets cool completely, cover the ramekins with a plastic wrap and place it in fridge for atleast two hours. While serving, loosen the sides of the ramekin with a knife. Invert the chilled créme caramel to a plate. what a picture :) cann't take my eyes! Thanks Nalini for giving me an opportunity for this guest post, loved making these eggless desserts for u.
Drooling over here. Wonderful guest post by Priya akka. Thanks Nalini for sharing. Wow.....m lost for words...its just too good....another standing ovation for Priya!!! Wonderful guest post.Well done to the two of you! Any substitute for agar agar? 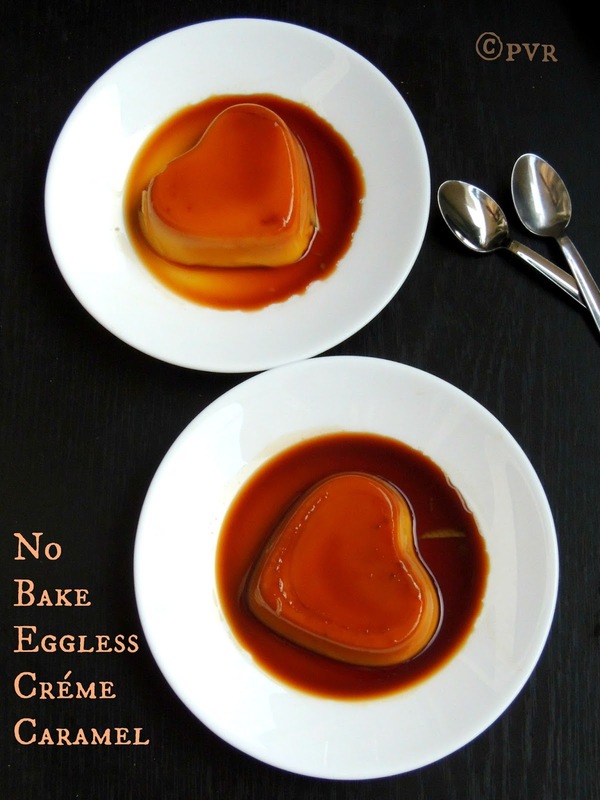 Wow..so tempting and delicious creme caramel, thanks Priya for this eggless and no bake dessert, bookmarked to try...lovely post Nalini..Congratulation on your blog's 2 nd Anniversary!! wow its so tempting dear. want to grab one. Where can we buy agar agar in India ? Any suggestions ? Thanks for the recipe. It came out awesome and had to drop a comment. Thanks again!!! My caramel sets hard and while removing part of it is hard and remains in the mould. What is yhe solution? If you don't have agar agar can you substitute with normal gelatin?